[New for 2012] I was pretty excited when I came across the news that Stone Ridge Creamery was releasing two new seasonal flavors. Sure, I convinced myself to try the Peppermint Cookies & Cream first because, well, I was afraid this next one wouldn't live up to it's potential. and guess what? It tastes like snickerdoodle swirl. Is that not the perfect scoop? I was so excited and dumbfounded at how cool this scoop looked... that I plopped it right out of the container and onto the crumby counter - NOOOOOOOOOO!!!! In protest of my foible, I boldly speared my spoon into the gorgeous swirl in front of you and then proceeded to dig deep into the heart of this container. Cinnamon Snickerdoodle, you have met your match! 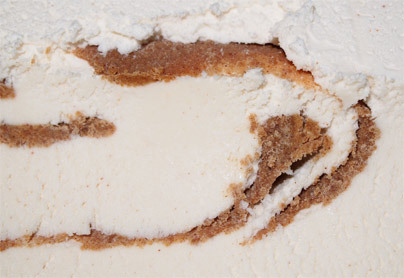 This ice cream has the awesome excitement of pulling apart a fresh baked cinnamon role. The sugar cinnamon flavor is complete and has got me uncontrollably scooping for me. The swirl puts this flavor up their with the best of them. Oh man am I impressed. The cinnamon flavored base is pleasant, mild (yet distinct) and complimenting the swirl perfectly. 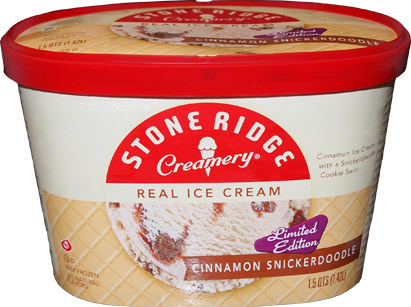 Is Stone Ridge Creamery just another store brand? I think not. They consistently set the bar high for themselves and may I even be so bold as to say that this may be their finest flavor. Granted I love cinnamon, it is an essential part of any quality breakfast, but mind blown people, mind blown. I'm now sad I'm full because I can't eat any more. Awesome job SRC, you knocked it out of the park with this one. 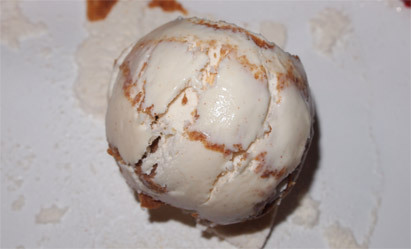 I adore a flavorful gritty swirl and I would happily put this excellent example of one up against any brand out there. Just Awesome. On Second Scoop: Oh I adore this flavor and my wife is a convert as well. I've had hundreds of ice creams and I can honestly say this is now one of my favorites. Awesome job. Anymore tormenting you want to do to me? asdfghjkl I will hunt you down and eat your ice cream. Which retail outlet did you snag this at? Fingers crossed for Save-A-Lot. That swirls looks incredible. Doubt I'd be able to find this around here though.